Reedville is a fisherman’s town on the Northern Neck of Virginia (between the Potomac and Rappahanncok Rivers). Reedville is home to a thriving menhaden commercial fishing industry. 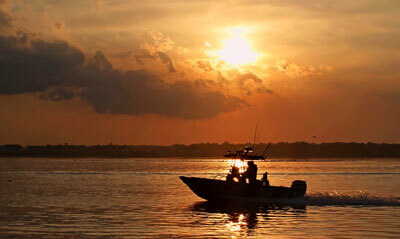 Several sport fishing charters are available for the recreational fisherman. Each year, the town plays host to the Reedville fishing Derby, a popular fishing tournament with large cash prizes. The Reedville Fishermen’s Museum is located in the center of the town’s historic district. The museum has a nice collection of traditional Chesapeake Bay work boats. While at the museum, pick up a copy of the Reedville Walking Tour brochure. The tour describes the turn-of-the-century Victorian homes which line Main Street. Reedville is also home to the Smith Island and Tangier Island Cruise boats. The Smith Island Cruise departs from the Chesapeake Bay Camp – Resort, the Tangier Island Cruise leave from Buzzard’s Point Marina. The boats operate from the beginning of May through mid October. They leave Reedville at 10:00am and return at 3:45pm. These isolated island towns are worth a visit and the cruise across the Chesapeake Bay is enjoyable. Reedville is located at the end of Route 360, which crosses the Middle Peninsula and Northern Neck from Richmond. Reedville is about a two hour drive from Richmond or Williamsburg, Va.
Fleeton Fields Bed & Breakfast -Located in nearby Fleeton in a waterfront, park-like setting. Features fine Victorian period antiques and modern amenities such as satellite tv and wireless internet. The Gables – Five-story mansion located in Reedville’s historic district. Constructed by a successful local sea captain. Grandview Bed and Breakfast – Located on a peninsula at the mouth of the Great Wicomico River. Ma Margaret’s House Bed & Breakfast – A lovingly restored grandmother’s home. A country Inn with a modern touch. Escape to the Bay – Million dollar view of the Chesapeake Bay. Beachfront Estate on the Chesapeake Bay – Waterfront home with private beach. Windsurfer and kayaks provided. Stunning River Retreat – Waterfront home with dock, large deck, pool table, hot tub. Charming Cabins on the Bay – Located at Ingram Bay Marina. Reedville Fishermen’s Museum. Dedicated to commercial fishermen in this Virginia community and the Chesapeake Bay. Buzzard’s Point Marina. The Tangier Island boat leaves from here. Also headquarters to the Bluefish Derby. Northern Neck Tourism Council. A guide to Northern Neck attractions.